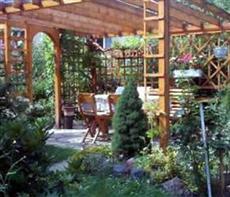 The Na Strani pension, a quiet family-run and non-smoking property, is located in a quiet residential area of Prague, only 7 minutes by underground from the city centre with all its sights and beauties. Due to its size and character, Na Strani offers an impeccable service to satisfy your individual demands and wishes. This cosy pension offers accommodation the whole year round. Local shopping is only a short walk away from the premises and thanks to the nearby Budejovicka underground station all of your travels start as soon as you cross the doorstep. The owner is only glad to assist guests with reserving any tickets or booking seats for cultural events in the beatiful city of Prague. The pension features numerous cosy guest rooms, a dining and entertainment room for 17 people as well as a beautiful terraced garden. Free parking is available outside the pension. Furthermore, each floor has a mini bar and two equipped kicthenettes are also available.